It’s officially winter! Although, we could have said the same during the past month as well, to be quite honest. Here we are again with another wonderful selection of winter coats and jackets, to keep you warm during the freezing temperatures. The brand of today is a newcomer, an U.S.A. brand called BGSD. 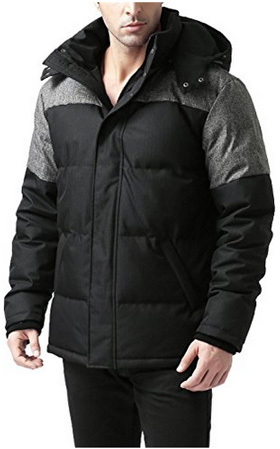 They sell their products online and, based on the reviews and opinions of those who have purchased and tried this brand’s clothing, these jackets seem warm and of good quality. In the collection we have selected eight of their best jackets and coats for men and women. * Note: The availability of the jackets (including colors and sizes) might change at any time. Also please check the jackets’ materials and features on the various shops before buying. We do our best to assure the accuracy of our articles, but sometimes they might contain errors. Starting with the first jacket for women, we have chosen Tisha, a long and elegant down parka. It is made of 100% Polyester for the outer shell and inner lining, and has a filling of 80% Down and 20% Feathers, with 600 fill power. The main zipper is waterproof and two-way, with a snap button placket over it. It has a removable hood, lined with faux fur trim, also removable. 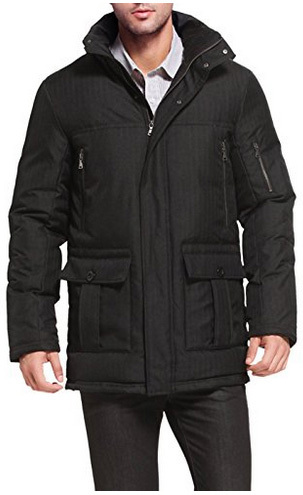 This is a highly insulated jacket, which fares well even in below zero temperatures. Since the shell material is waterproof, you can wear it comfortably in rain and snow. And for those who live in windy areas, this coat is windproof, so there is no chance that cold drafts will manage to get through. The cuffs on the inside are made of ribbed, elastic material and there are two side pockets with concealed zippers. On both sides, parallel to the main zipper there are two zippers which can ease both movement and sitting when open. It comes in the color Black. This next coat is also a down parka, made of 100% Polyester, with a filling of 80% Down and 20% Feathers. It comes with a high collar and oversized hood, lined with faux fur trim. Both hood and fur trim are detachable. The outer cuffs are loose fitting, whereas the inner ones are made of knitted material, which are elastic and adjust according to the wrists’ size. 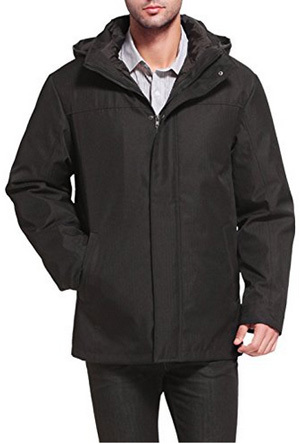 This is an insulated jacket, windproof and water resistant. The length is above the knees and it comes with a covered main zipper, with a toggle button placket, which is not just practical, but also looks good. There are several pockets on this jacket, four located on the sides, two zipper and two flap pockets, one chest pocket, one zip and one flap on the arms and inner pockets, too. This design comes in the color Black. Continuing with a stylish down coat, slightly shorter than the two previous ones, this model is called Addi and it comes with a beautiful pattern for the outer quilting. It is a combination of horizontal, diagonal and diamond quilting, making this coat look trendy and classy. The material is 100% Polyester and the filling, just like the previous ones is a combination of 80% Down and 20% Feathers, with 600 fill power. The filling and material fully insulate this parka and it is both water and wind resistant. There are two outer pockets on the sides and it has also inner pockets. 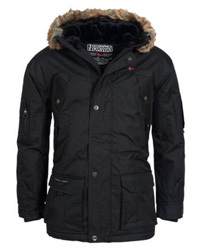 The main zipper is covered by a snap button placket and the hood is detachable, as is the faux fur lining. This coat also comes in the color Black. The next jacket for women is the BGSD Ellen, a leather jacket made of 100% New Zealand lambskin leather for the shell and 100% Polyester for the inner lining. It is hoodless, with flap collar and an uncovered main zipper. There are two outer slip pockets and the entire jacket is decorated with stitching details, mainly focused on the back. This gives a more carefree and casual look to the jacket, all the while keeping it stylish. It is suitable for cool temperatures and preferably dry weather. It comes in two colors: Black and Espresso. Now let’s take a look at the BGSD jackets we have selected for men. David is the first one, a great down coat that can be worn with either casual or formal clothing. The material is 100% Polyester with a filling of 80% Down and 20% Feathers. It has four exterior pockets, all oversized, one on the left sleeve and two on the inside. 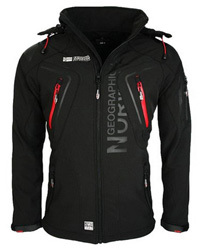 This is a waterproof jacket, as well as windproof, fully insulated and medium-length. It comes with a waterproof zipper, covered by a snap button placket and a removable hood. The inner cuffs are hidden and made of ribbed, elastic material. There is one color option: Black. Ethan is a casual jacket, with a 80% Down and 20% Feathers filling, made of 100% Polyester for the shell and lining. It is a quilted jacket, with a lined and removable hood. The collar is high and it zips up and closes with the snap button placket of the main zipper. There are two zip pockets on the sides and two inner pockets, with enough room to carry your belongings. The inner cuffs are slightly longer, and go out of the outer ones. They are made of ribbed material, which is elastic and fits nicely around the wrists. 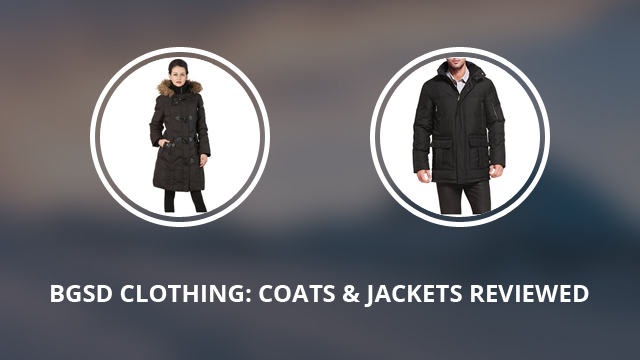 It is a weatherproof jacket, able to withstand freezing temperatures and wet conditions. As for the color, it is a combination of Black for the main part, with grey shoulders and upper sleeves. On to a truly stylish jacket, which will not only keep you comfortable but also make you look well-dressed. This is the Brent, “3 in 1” model, which comes in two layers, a Polyester one on the outside and a Down jacket on the inside, which can be detached from each other, so you can wear them according to weather. 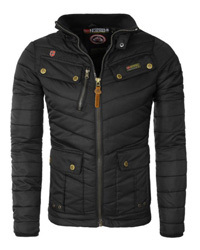 It is a highly insulated jacket, with a down filling of 80% and the remaining 20% being Feathers. 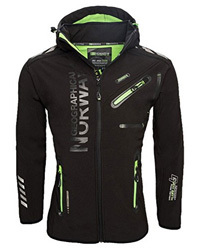 It comes in the color Black and has a removable hood on the outer jacket. There are two side pockets on the outer jacket and two on the inner one. The main zipper is covered by a snap button placket and the cuffs are adjustable. Next is the BGSD Samuel, a leather jacket made of 100% New Zealand lambskin leather, like Ellen, the women’s version. The inner lining is 100% Polyester, as is the filling. It comes with a four-button closure to the front, with flap collar and two slip pockets on the sides for the hands. As for your belongings, there are interior pockets to help carry them. The stitching details are minimal and keep this jacket elegant, suitable to be worn with formal clothing and work suits. It is a medium-length jacket, suitable for dry weather as it is not waterproof. 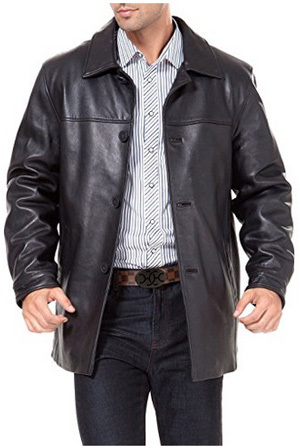 But as with most leather clothing, it can be treated and turned into a waterproof jacket. Black is the color option.